This post is about the Nizamuddin Basti walk organized by the Hope project in Delhi. The hope project India is an excellent NGO that besides social welfare services for the people in Nizamuddin Basti has also developed the Nizamuddin Basti walk for tourists. My favourite area of Delhi is without doubt the narrow lanes full of tombstones, mosques, shrines and street food stalls of Nizamuddin basti. One of the oldest parts of Delhi. In the 12th century it was just a small village around the sufi shrine of Nizamuddin Auliya. However, over the centuries it was slowly engulfed by the larger city of Delhi. The neighbourhood still feels like a village in a city though. When you walk through the small lanes it feels like you are travelling back in time. Nizamuddin basti managed to keep its own characteristic village atmosphere. Inside you will find a lot of hidden gems that even most Delhiites are unaware of. Nizamuddin also kept its spiritual essence. The majority of the people who live in the basti are muslim, but they practice a specific branch of Islam called Sufism. The area is full with mosques, tombstones and shrines. At the heart of the basti is the shrine of Nizamuddin Auliya. Every thursday and sunday night thousands of people come here to listen to the qawalli’s. Sufi devotees perform the religious songs with passion and faith. The best way to discover all the secrets of Nizamuddin basti is a walk with the Hope Project. Sufi teacher Pir Vilayat Inayat Khan was moved deeply by the poverty of the people living in Nizamuddin. In 1980 he founded the Hope project with the vision to translate sufi ideals regarding service to humanity into practice. Currently they run a community health center, vocational training courses and women micro-enterprise units. We started our walk in Hope’s community center. The first stop was their own bakery where several women were busy baking cookies for the German embassy. The smell was delicious and the taste even more so. We could also see the children’s day care center and the evening computer classes. The center was very lively and many people seem to benefit from it. It’s a small NGO, but even after a short visit you can feel they make an impact and play an important role in this community. Then it was time to explore Nizamuddin basti. Without our guide we would never have seen the area as we saw it now. The basti is full of narrow lanes that, without doubt, we would have got lost in if we were by ourselves. On top of that our guide managed to point out hidden shrines and tombstones that we would otherwise have missed. I was intrigued by our guide’s stories and explanations of the long history of the area and about Sufism. This tour turned out to be one of the most interesting things I did in Delhi. We took the tour in the afternoon, because I read there is excellent food in the area. I wanted to take the opportunity to have dinner here. Nizamuddin is indeed a foodies’ heaven and one of the best areas to try out different types of street food, especially kebabs. Our guide recommended some places, but the long lines of people waiting at the popular places told us where to go. I went back to my hotel with a full belly and a satisfied mind. The Hope project runs 90 minute walks through the basti for 200 rupees per person. It is best to call them in advance to arrange a time and pick up from a meetingpoint. As this is a muslim area it’s best you wear modest clothing. For men this means no shorts and for women this means you should cover your legs and shoulders. Nizamuddin is close to Humayun’s tomb so it is best to combine your visit to Humayun’s tomb with a visit to Nizamuddin. The nearest metro station is the Jawaharlal Neru station on the violet line. From there it is a 2 kilometer walk to Humayun’s tomb and Nizamuddin. 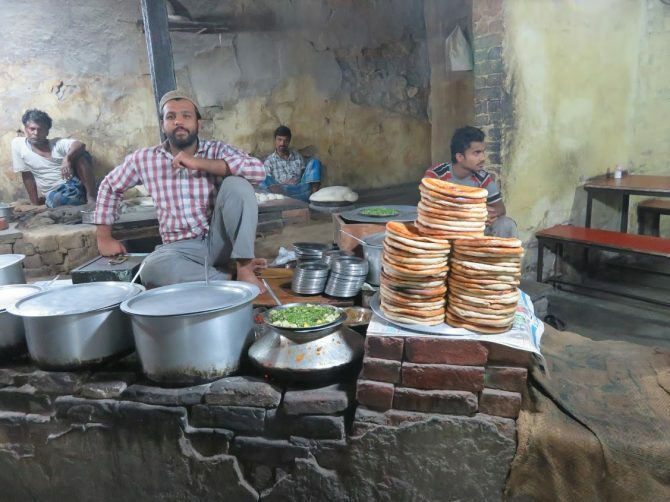 The tour takes between 1,5 to 2 hours, but I suggest you spend a bit more time on your own in Nizamuddin to visit the dargah of Nizamuddin Auliya and try some of the local streetfood. The best time to visit Nizamuddin is in the afternoon. If you visit on Tuesday or Sunday you can get the chance to listen to the qawalli’s in the main dargah (mausoleum) of Nizamuddin Auliya. It can get very busy with crowds of people trying to push themselves inside. If you are travelling as a woman alone this is maybe not the best idea. If you want a more quiet experience listening to qawalli’s you can also visit the smaller dargah of Inayat Khan on Friday evenings. Love hearing about social enterprises like this one! It’s a great way to promote responsible tourism.